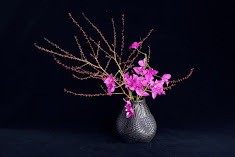 We have been thinking what ikebana (a style of Ikebana in the Muromachi period) is. It seems to mean making flower alive. Does it mean whether to make dead flowers revive or to make dying flowers live longer? This is actually a really important question. Considering that so little is known and much research is needed in the historical of Ikebana, we may need to propose a bold hypothesis to answer to the question. A highly regarded Ikebana researcher, Yuzo Yamane pointed out three cultural factors that contributed to the birth of Ikebana in the Muromachi period: aristocrat factor, Buddhism and Shinto factor, and Samurai factor. 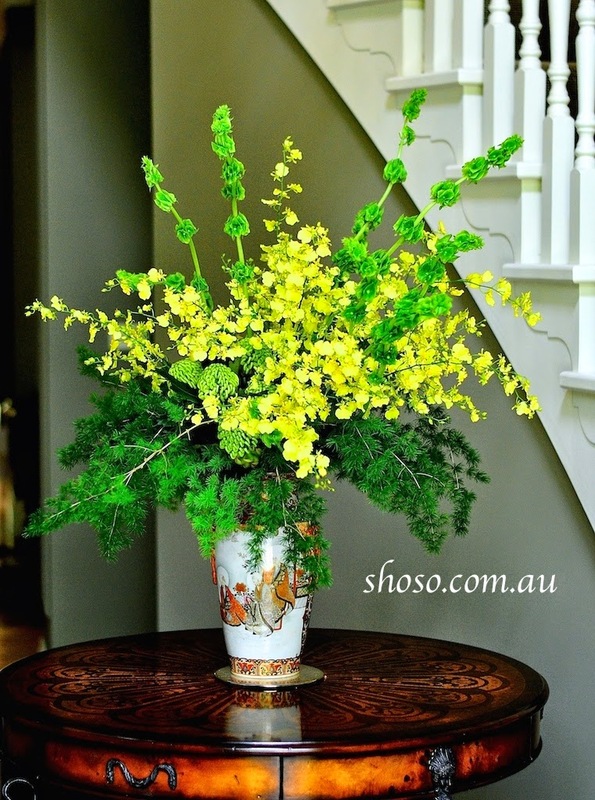 Combination of there factors are thought to have contributed to the development of Ikebana. However, I’m not satisfied with his theory. Assuming that Ikebana is related to the fundamental factors in Japanese culture, I have to propose my own hypothesis regarding the origin of Ikebana in the next issue. 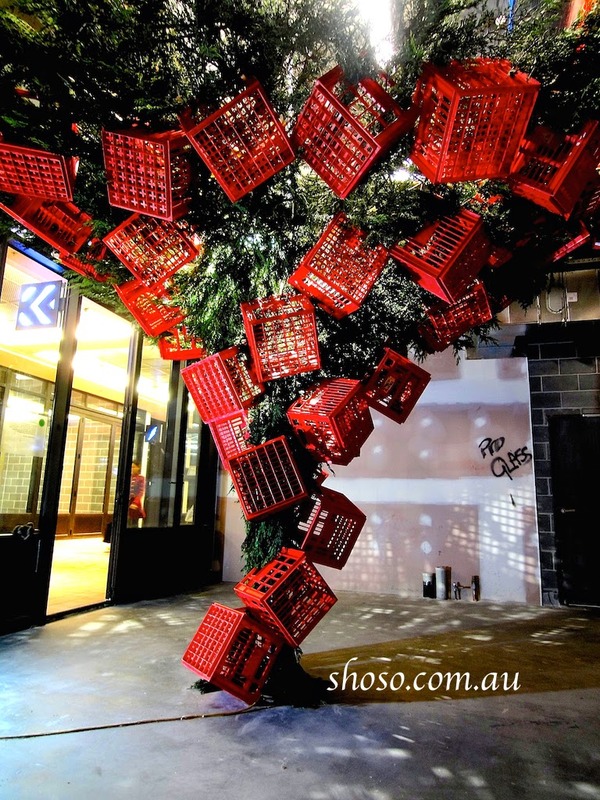 This month I would like to show my installation, the Sacred Tree that I made for the new arcade in Upper West Side, Melbourne in July this year. Although the idea of Shimenawa—a maker for a sacred space in Shinto—was behind this work, many commented that it was like a Christmas tree. I don’t mind about such interpretations. 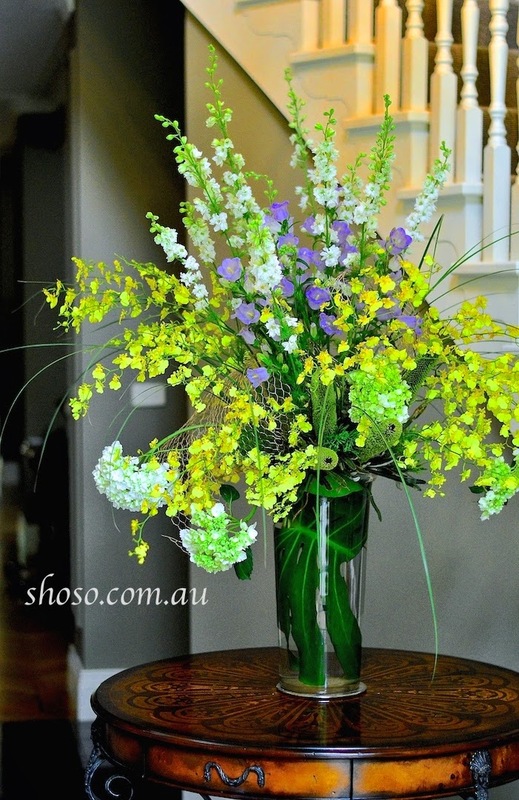 These are another example of our Home Party Package A, 1 medium + 1 small arrangements. Shoso's Japanese aesthetics course has started at RMIT university. Our project this week was wire sculpture. Very creative students! We have been trying to find out the true meaning of the term, Ikebana. Ikebana literally means to make flowers alive. Sounds simple. But what does that really mean? Making flowers alive could have two different meanings depending on whether it is alive or not before making arrangements. If the flower is dead, making it alive means to bring back to life. If the flower is alive, making it alive means to maintain its life. When someone first used the term, Ikebana, stressing that he is not simply making flowers upright like tatehana but making them alive, did he regard the flowers as alive or dead? It seems to be a small difference, but we often find something important by paying attention to such a small differences. Thinking about this may leaed us to much more profound issues about Japanese view on nature and art. I would like to show you another commercial work of mine this month. This is an arrangement for a home party. Light colors of blue and yellow are working so well in this work. I used this image for free calendars 2015. Please download them from my website. If you are looking for a great Christmas gift for someone special, please consider our Ikebana lesson vouchers, which is also available from our website.